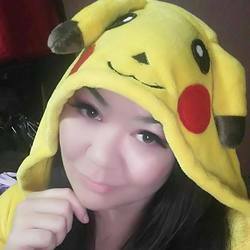 Michelle Mussoni, also known in the cosplay world as Cospinay or Mogchelle, started in the costume world by just being an average geek half Filipino/half American girl from Guam, who moved to the US and started attending a Japanese Animation conventions in 1999. Seeing all the other people in costumes around, just looked like a fun time, like it was Halloween all over again! Her love for the artwork in anime, video games, and comic books made her want to bring the 2D images from the pages and on the screen to real life. She's also been featured in several national and international magazines, and interviewed by several online entertainment news sources for her costume work. Over the years she has won countless awards for both craftsmanship and performance, starting as a novice, and working her way up to the master level of competition as of 2003. In 2010 she had the honor of winning a chance at the Yume Cup at Anime Central, and was shipped off to New York City as the Mid-West representative in a nation-wide cosplay competition along with the very talented Alena VanArendonk from ...And Sewing is Half the Battle to compete for the national prize of the Yume Cup! In 2012, she reached international award status by competing at the World Science Fiction Convention, where 2 awards were won, Best Re-creation, and a special Golden Quill award for a custom set of angel wings. Every year she challenges herself to new techniques in the costuming and makeup world, and has created several of her own techniques as well, some which have made trained costumers and prop makers cringe, but then smile when they see it worked! Conventions across the country often ask Michelle to present a panel or workshop on how she does what she does. Those workshops vary from lightweight armor creation, molding and casting, wig design, wings, or character portrayal, with more being added every year, all in the effort to spread her love for DIY costumes for the average person who can't shell out thousands of dollars for wearable art. She is open to a few slots every year for commissions to the public. She has done work for The Children's Museum of Indianapolis, Manga/Starz Entertainment, Studio Ironcat LLC, and several other video game, comic book, and anime publishers across the country.